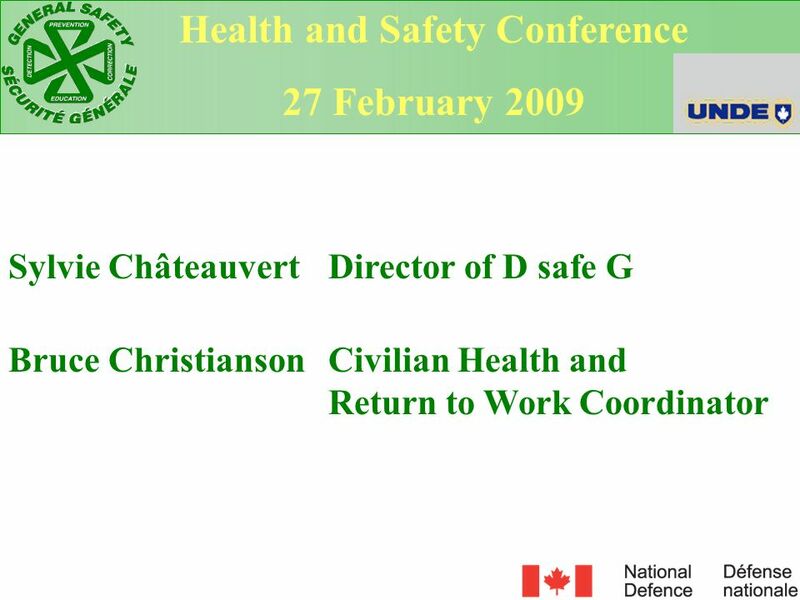 27 February 2009 Sylvie Châteauvert Director of D safe G Bruce Christianson Civilian Health and Return to Work Coordinator Bruce Christianson: I have recently joined D safe G as the Civilian Health and Return to Work Coordinator. The knowledge that I bring to DND in relation to RTW is my experience in disability management. I acquired it helping over 1500 injured workers reintegrate their jobs when I worked as a physiotherapist. My most recent work experience with Health Canada’s Workplace Health and Public Safety Program has allowed me to apply my RTW knowledge to the Federal Public Service’s H&S legislation. 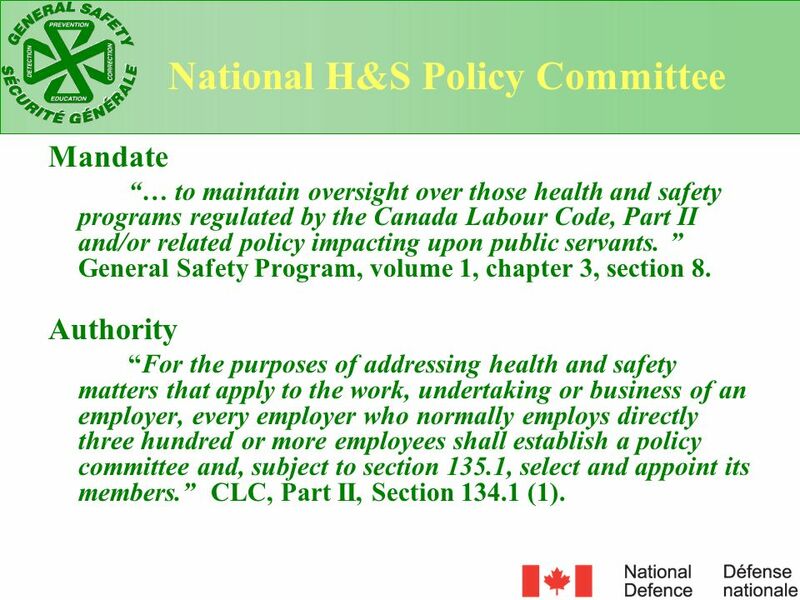 Mandate “… to maintain oversight over those health and safety programs regulated by the Canada Labour Code, Part II and/or related policy impacting upon public servants. ” General Safety Program, volume 1, chapter 3, section 8. Authority “For the purposes of addressing health and safety matters that apply to the work, undertaking or business of an employer, every employer who normally employs directly three hundred or more employees shall establish a policy committee and, subject to section 135.1, select and appoint its members.” CLC, Part II, Section (1). Membership Fifty percent or more representation chosen by the bargaining agents and the remainder by the unit CO. For public service employees a term of office is two years. 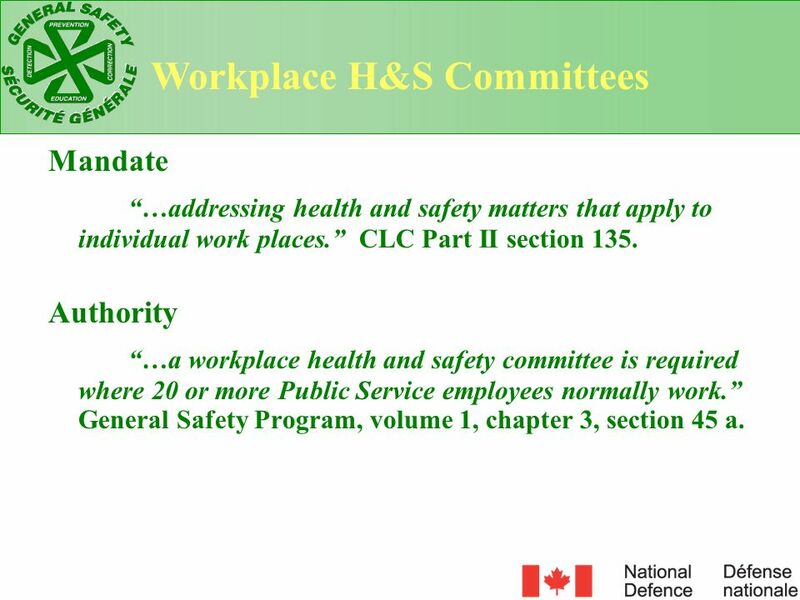 Mandate “…addressing health and safety matters that apply to individual work places.” CLC Part II section 135. Authority “…a workplace health and safety committee is required where 20 or more Public Service employees normally work.” General Safety Program, volume 1, chapter 3, section 45 a. 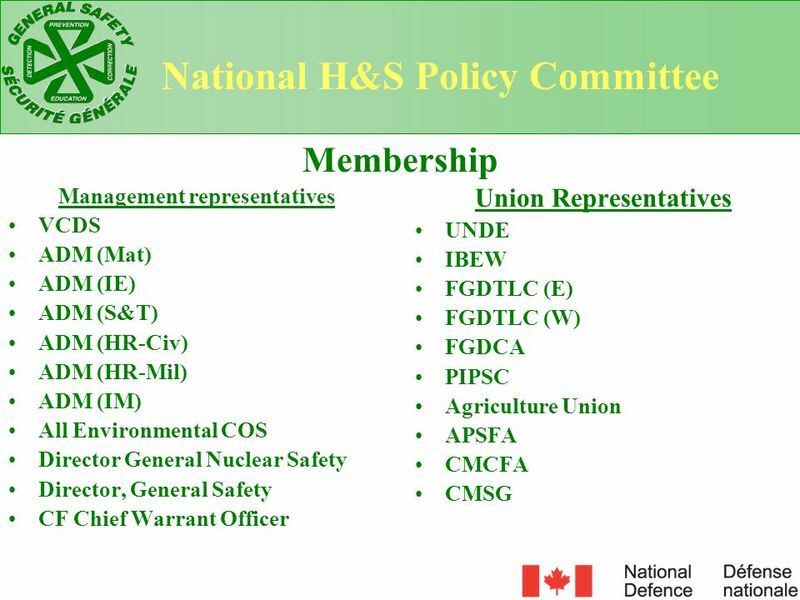 Management Representatives D safe G (co-chair) VCDS DGER DGRCHRS ADM (HR-Civ) ADM (S&T) ADM (Mat) All Environmental COS CMP Union Representatives UNDE IBEW FGDTLC (E) FGDTLC (W) FGDCA PIPSC Agriculture Union APSFA CMCFA CMSG A sub-committee to the previously mentioned National H&S Policy Committee is the National RTW Committee. Its membership consists of a joint labour-management committee. 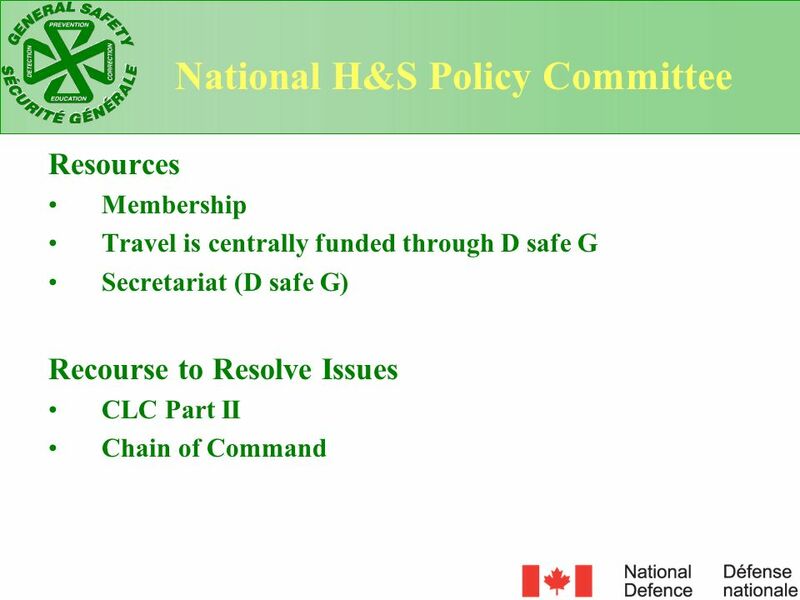 It is co-chaired by the director of General Safety and one union member that alternates every year. 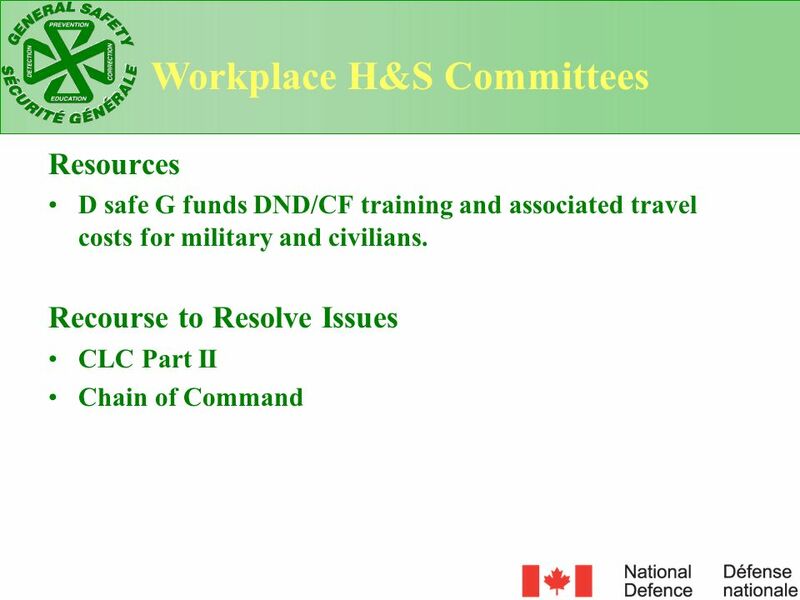 Mandate “…providing advice and guidance for those responsible for administering the Department of National Defence Return to Work Program.” RTWP Manual, chapter 3, annexe A, section 1. 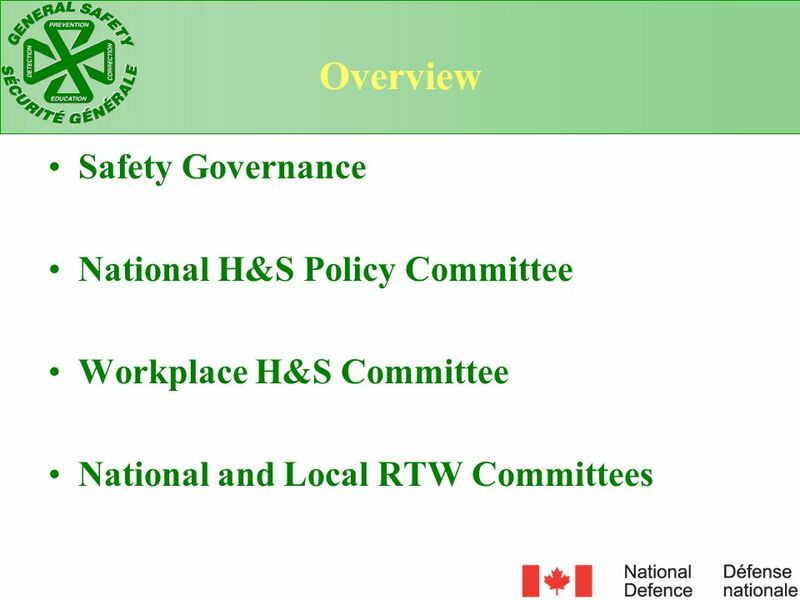 Authority VCDS National H&S Policy Committee National RTW Committee Its mandate is to provide advice and guidance to the National H&S Committee and D safe G which are responsible for administrating the Departmental RTW Program. 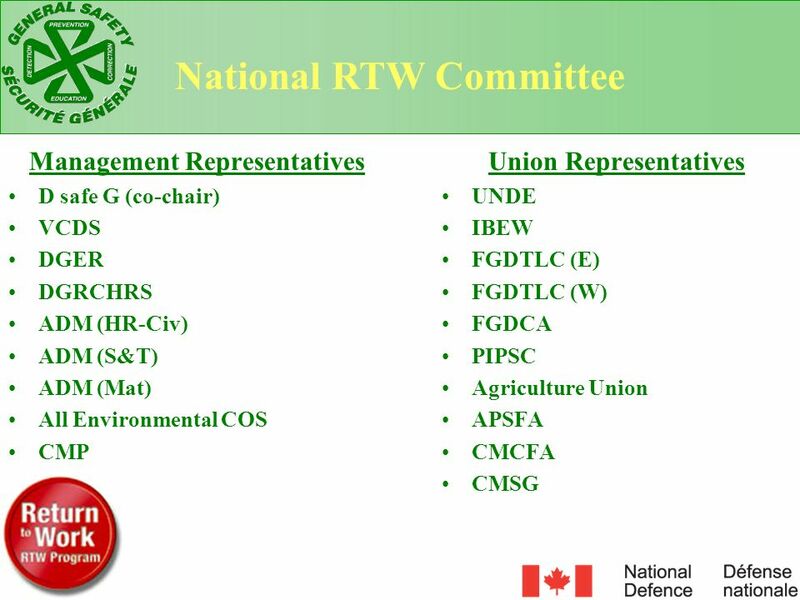 The National RTW Committee is governed through the Vice Chief of Defence Staff who is responsible for overseeing the RTW Program. 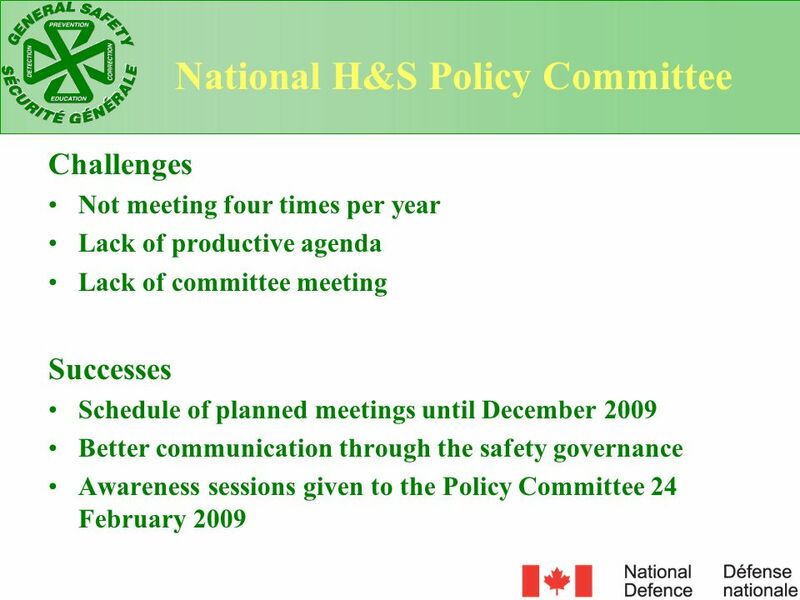 The VCDS is co-chair of the National H&S Policy committee. As mentioned earlier the National RTW Committee is a sub-committee of the Policy Committee. Management Representative Union Representatives RTW Program Advisor/GSO Human Resource Officer Unit’s HR Business Manager OR Assign RTW Duties: Workplace Health and Safety Committee Injury on Duty Leave Committee Employee Assistance Program At the local level RTW issues can be addressed through a committee in one of two ways: The first is establishing a RTW Committee with a management rep, union reps from all bargaining agents, RTW Program Advisor, HRO and the Unit’s HR Business manager. 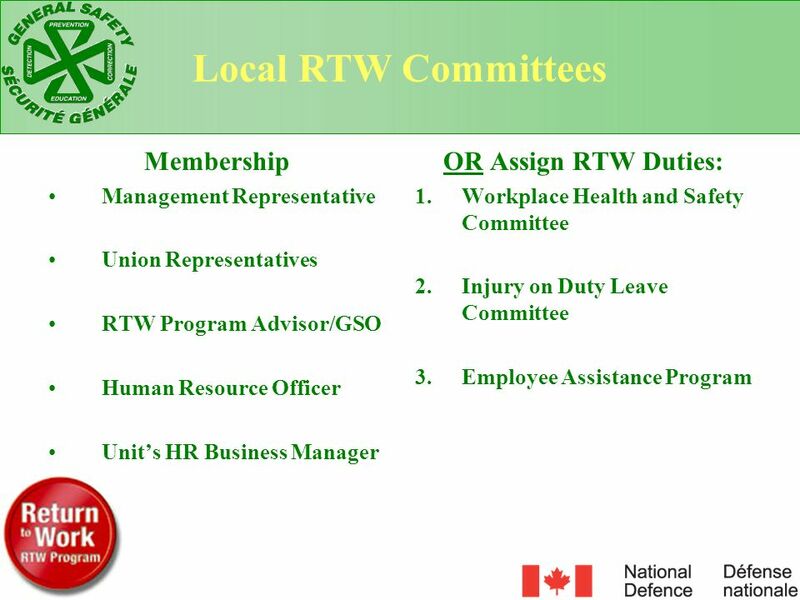 OR assign RTW duties to one of the existing committees. “… provide policy, direction, and procedures for the organization’s Return to Work Program.” RTWP Manual, chapter 3, section 9. Authority “Each Base, Wing, and major unit with more than 20 civilian employees must establish a committee or assign return to work duties to one of the previous mentioned committees in order to provide resources, policy direction and help the Return to Work Program Advisor manage the Return to Work Program.” RTWP Manual, chapter 3, section 8. 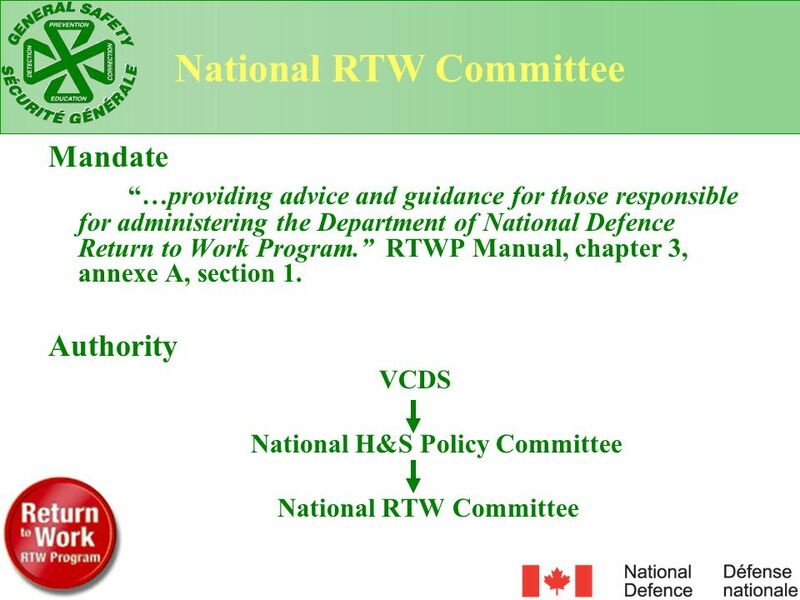 Although the local RTW committees establish their own terms of references, their main mandate remains the same department wide. That is to provide policy direction and procedures for the organization’s RTW Program. 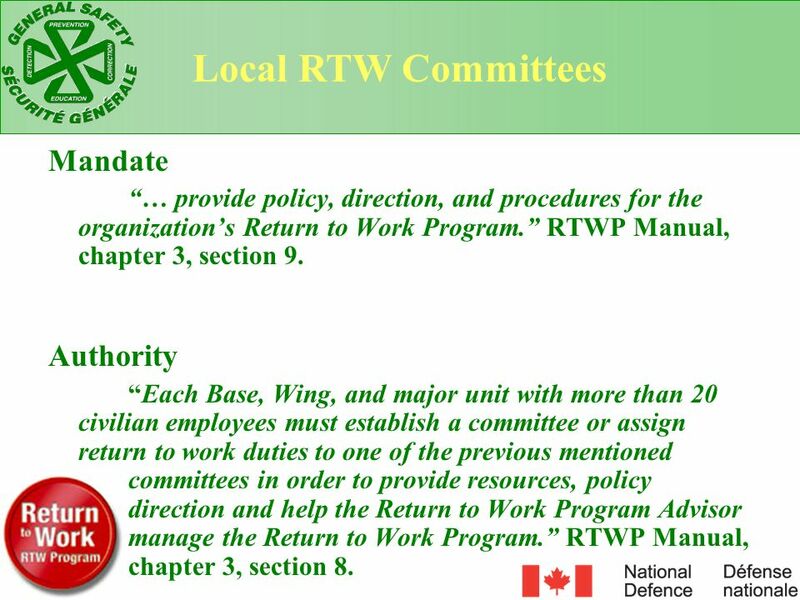 The General Safety Program’s RTW manual states that each base, wing, and major unit with more than 20 civilian employees must establish a committee or assign RTW duties to one of the previously mentioned committees. RTW Program Resources D safe G Funded Training RTW Advisors Course RTW Committees Course RTW Awareness Course Locally Funded Training RTW Employee Awareness Course Now that we have looked at how the RTW program is administered and governed nationally and locally through its respective committees, lets examine the RTW program’s training resources. Four courses are available to educate the various stakeholders about the RTW Program. The RTW Advisors Course, RTW Committees Course and RTW Awareness Course are funded by D safe G. The RTW Employee Awareness Course is locally funded. 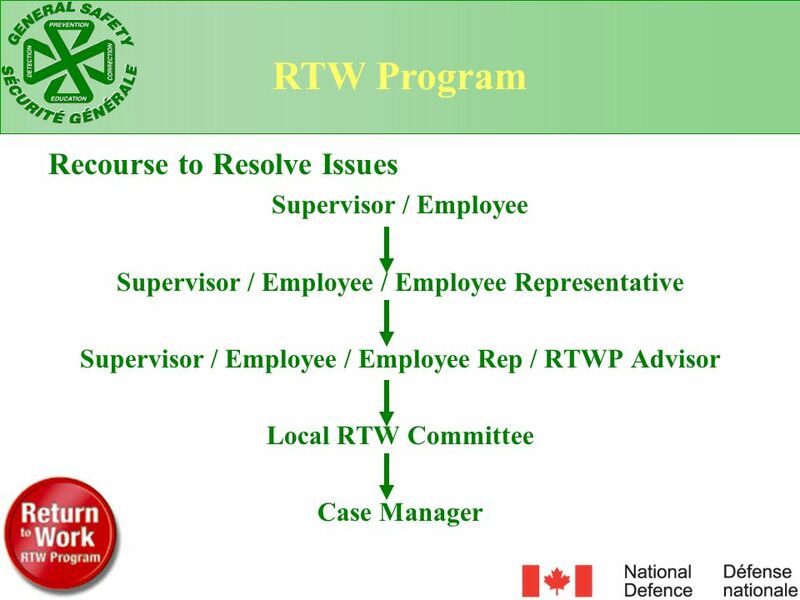 Supervisor / Employee / Employee Representative Supervisor / Employee / Employee Rep / RTWP Advisor Local RTW Committee Case Manager One of the important features that is highlighted in all of the RTW Training courses is the agreement process. Most RTW processes are resolved in the first 2 steps. A small number of cases need resolving by the last 2 steps. 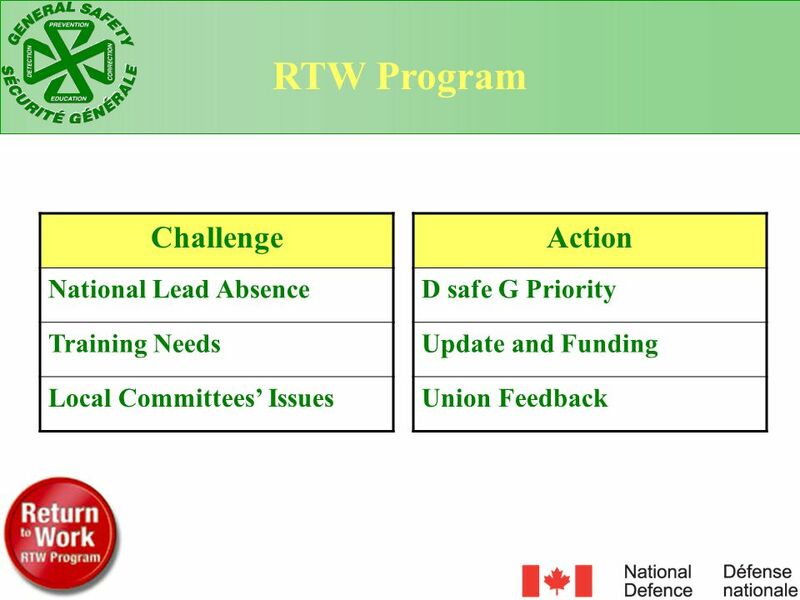 Local Committees’ Issues Action D safe G Priority Update and Funding Union Feedback All though the National RTW Committee and D safe G are seldom involved in the challenges faced during the agreement process, other challenges that need resolution, have been identified. These include: National Lead Absence: The National RTW Coordinator position has been vacant or assigned as an acting position for a total of 3 years in the last 4 years. And the National RTW Committee did not meet for a span of 16 months. 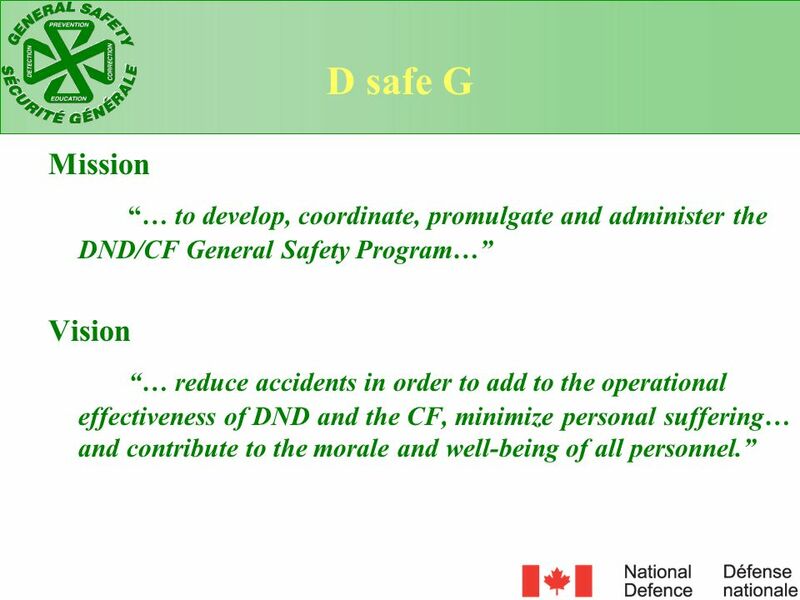 D safe G has made it its priority to improve the RTW Program by hiring a permanent National RTW Coordinator and getting National RTW Committee meetings back on track. In fact, last Tuesday the Committee members met in Ottawa. Training needs: A RTW Assessment questionnaire was sent 13 Jan 09 to all RTWP Advisors. It was identified that training for employees, supervisors, committee members and RTWP advisors is needed. Discussions with RTWP Advisors, course contractors and auditing the supervisors course as shown that the courses should be updated. All of the RTW courses will be updated and RTW training for advisors and committee members will be provided in the coming months. Local Committees’ issues: Some local programs have no RTW Committee, others are inefficient in resolving RTW issues. Some are running in isolation of union reps. D safe G will need unions help in identifying such committees and making the necessary recommendations to improve the situation. 20 RTW Program Success Several Local RTW Programs have established good communication and collaboration between stakeholders, creating effective and efficient RTW strategies for injured/ill workers. 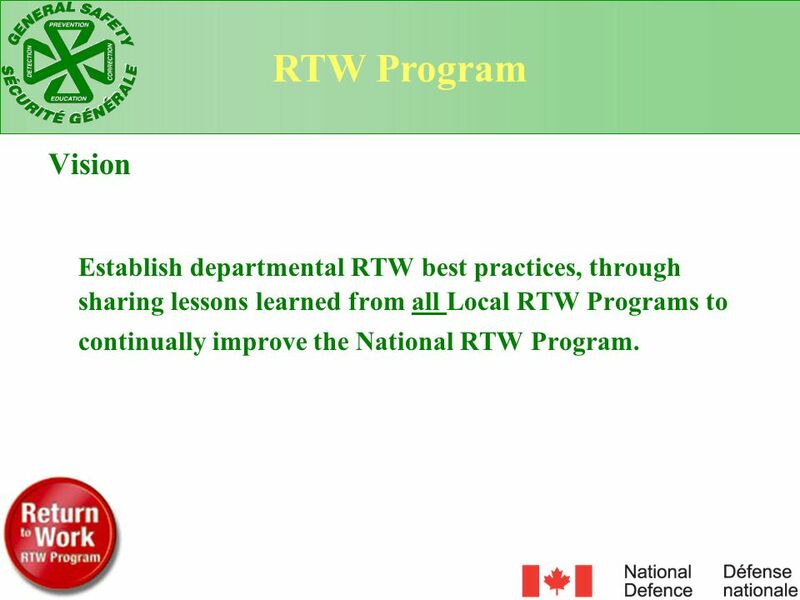 The same RTW assessment questionnaire has highlighted some successful Local RTW Programs. 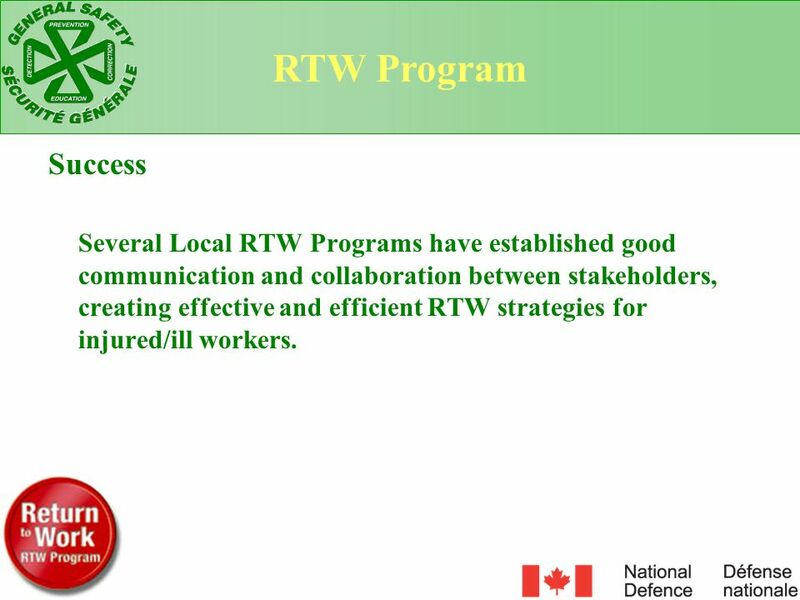 These local programs have all mastered the basics in RTW, effective communication and collaboration between all stakeholders. 21 RTW Program Vision Establish departmental RTW best practices, through sharing lessons learned from all Local RTW Programs to continually improve the National RTW Program. 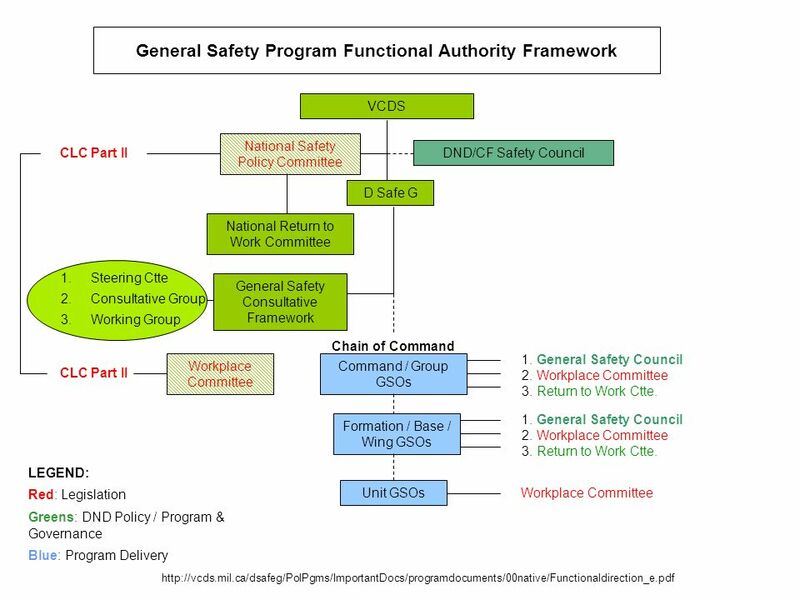 Building from the lessons learned of these successful Local RTW Programs, D safe G’s vision is to continually improve the National RTW Program. As union representatives you have direct contact with the key stakeholders, therefore in order to achieve our common vision, D safe G will need your continued support. Download ppt "Health and Safety Conference"
RETURN TO WORK WILL SAVE MONEY AND ITS THE RIGHT THING TO DO FOR THE EMPLOYEES. ADM (HR-Civ) - Assistant Deputy Minister (Human Resources - Civilian) SMA (RH-Civ) - Sous-ministre adjointe (Ressources humaines - Civils) 1 A Bargaining. 10 th European Work Hazards Conference September 29 th to October 1 st 2006 Jurmula, Latvia. Safety Committee Orientation Environmental Energy Technologies Division November 18, 2011. OHS&W Committee Training. View notes pages for detailed information about each item. View slides and information in the current order or look at particular. Council Orientation CAO Office The Corporation of the Town of Amherstburg COUNCIL ORIENTATION CAO Office.